The painting will lead a selection of works from the Collection of Richard E. Lang and Jane Lang Davis – one of the most important private collections of 20th century art ever assembled. The full Lang Collection now belongs to a private charitable foundation, whose purpose is to further the mission of cultural organizations through the donation of both funds and of artworks. The work is equally notable for the fact that it is on offer from the Collection of Richard E. Lang and Jane Lang Davis. Married from 1966 until Richard’s passing in 1982, Jane and Richard assembled what is indisputably one of the most important private collections of 20th century art, spanning from Cubism through Abstract Expressionism. The Langs were passionate philanthropists, particularly in their support of the performing and visual arts in Richard’s native Seattle – especially the Seattle Art Museum, where Jane cultivated many of the institution’s early shows of Contemporary. Both Richard and Jane were instrumental in supporting the expansion of SAM to its current downtown location. The Langs’ storied collection now belongs to a private charitable foundation, whose purpose is to further the mission of cultural organizations through the donation of both funds and artworks. 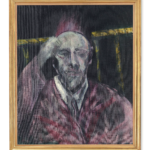 Proceeds from our May sales of works by Francis Bacon, Alberto Giacometti, Franz Kline and others will support that mission, which is in keeping with the Langs’ lifelong commitment to both art and philanthropy. Study for a Head will travel to Hong Kong (March 29 – April 2), Paris (April 8 & 9) and Los Angeles (April 16 & 17), before returning to New York in advance of the official opening of Sotheby’s newly- reimagined galleries on York Avenue, on 3 May. All works on offer from the Lang Collection will be on public view at that time.